A reactor loaded at Felbermayr's heavy load port in September weighed in at 380 tonnes. The steel giant was also manufactured in Linz. Namely by Schoeller-Bleckmann Nitec GmbH (SBN), a globally operating manufacturer of high-pressure heat exchangers and reactors. At approximately 220,000 square metres of open space and 5,000 square metres of assembly and storage halls, Felbermayr's heavy load port is almost a paradise for heavyweights. The equipment manufacturer SBN, too, opted for final assembly of the high-pressure equipment which was pre-manufactured in parts in Ternitz in Linz' heavy load port in order to actually make it possible to ship the end products to the seaports. 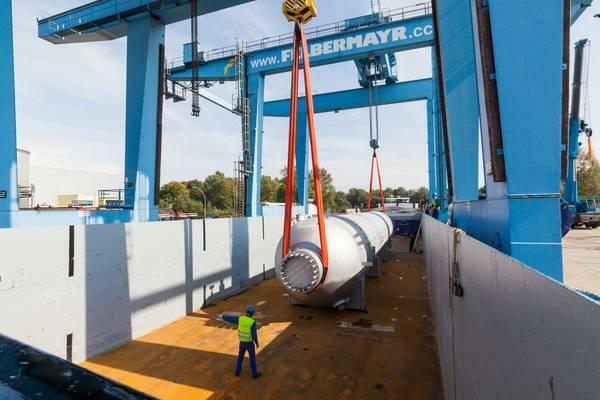 "Here, our customers find the ideal conditions for the manufacturing of such tanks," Jürgen Steinbrecher of Felbermayr transport and hoisting technology. Apart from the manufacturing and storage halls, short distances to the inner harbour with rail and street connection are among the advantages for the shipping and transportation industry. A point Johann Mitter, production manager of SBN, a member of the Austrian Christof Group, confirms:"What matters for us is proximity to navigable water with loading facilities." Thus, the two reactors with unit weights of 380 and 150 tonnes, respectively, were lifted onto a 16-axle self-propelled unit by means of an overhead crane in the manufacturing hall and transported to the nearby inner harbour. Even this large tank with its length of 27.5 and width of 3.93 metres could be transported in a relatively short time thanks to the self-propelled unit and its transversal control options. Two gantry cranes with 400 and 200 tonnes of lifting capacity are available at the inner harbour. 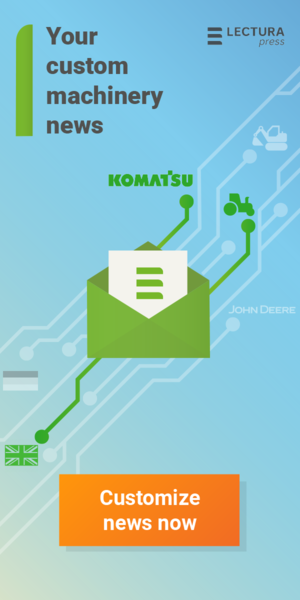 With both combined, loads of up to 600 tons can be manipulated. Both cranes were used in combination to handle the 380 tonne tank. Its little brother, still weighing in at a hefty 150 tonnes, was subsequently transported from the manufacturing hall to the inner harbour by means of an 8-axle SPMT and loaded onto the inland water vessel. The two were accompanied on their way to Antwerp by two additional components of roughly 130 and 240 tonnes. Thanks to optimal planning, the ship could sail on the very same day. "By the way, the nine-day journey to the Belgian port of Antwerp was realised by Felbermayr's subsidiary company Haeger und Schmidt based in Duisburg," Steinbrecher adds. Final destination of the two tanks is a factory in Texas. There, the high-tech steel giants are used in a plant manufacturing nitrogenous fertiliser.